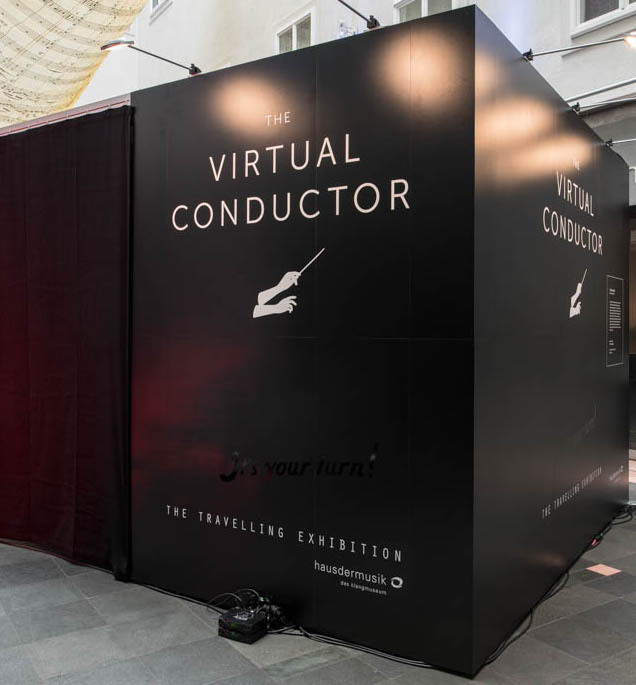 The Virtual Conductor goes on tour. 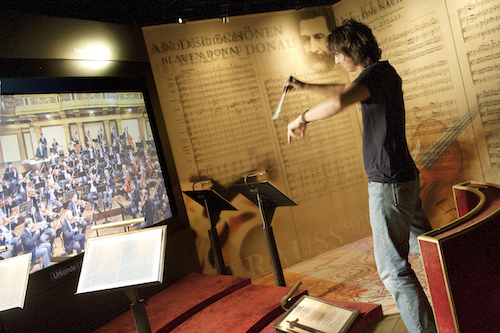 Haus der Musik presents the “Virtual Conductor” – the interactive Highlight at the Sound Museum with more than 3 Million visitors – as a special and unique travelling exhibition to be used at events worldwide. Globally unique – the interactive highlight of the sound museum. At the digital music stand, you choose between the Blue Danube, Annen Polka and Orpheus Quadrille by Johann Strauss Junior, Eine kleine Nachtmusik by Mozart, Brahms’ Hungarian Dance No. 5 or the Radetzky March by Johann Strauss Senior. If you need help, you’re in luck, because at the beginning of every piece Maestro Zubin Mehta, Honorary President of Haus der Musik, demonstrates how it should best be performed. Getting started is extremely easy: take up the baton, select the piece of music and conduct! The musicians then attentively follow your movements: the higher you raise the baton, the louder the orchestra plays. If you turn toward specific sections of the orchestra, these sound louder than the rest. And of course, the faster you conduct, the quicker the orchestra plays – this is all possible thanks to a specially designed time-stretch algorithm. To emphasize voices, four audio channels are processed in parallel and mixed in real time. 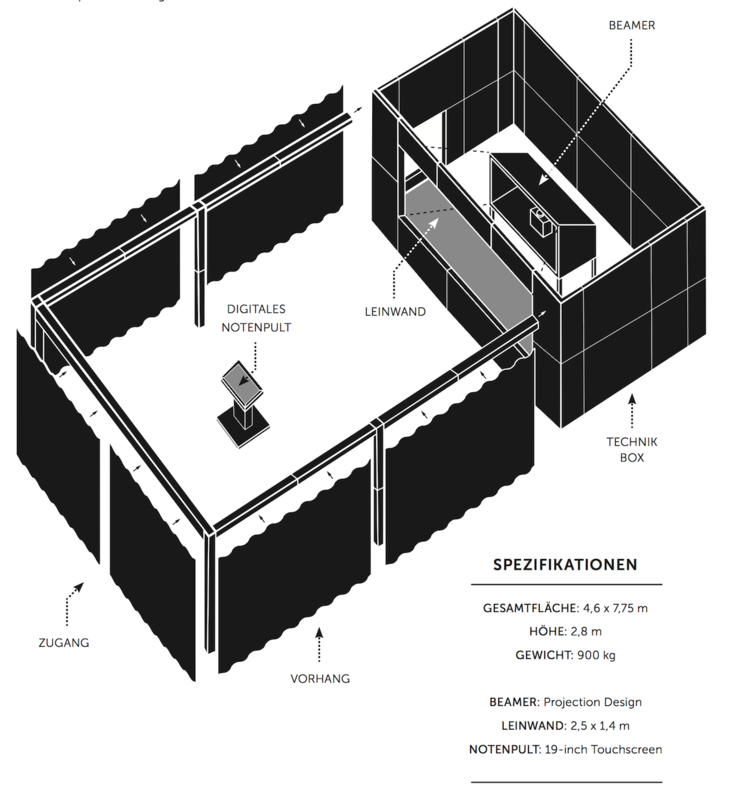 Haus der Musik now offers a travelling version of the Virtual Conductor – for exclusive, individual use. The installation consists of high-end elements, including a high-precision sound system, crystal clear rear projector and digital, touch-enabled music stand, to provide a unique musical experience, even on tour. All the components have been specially designed and adapted.